At the time of year I feel like I hit the ground running every day at 5:30 am and I fall into bed exhausted at 10pm every night. In between I spend several hours working on my blog, at school teaching, baking holiday treats, working on homemade holiday gifts, and finishing up holiday orders. There are not enough hours in the day during November and December! Because I do so much baking during the holidays as well as doing all of my normal activities I don’t have much time for dinner. I hate the thought of ordering in or eating out more then once or twice a week. That means I’ve been trying to find the easiest and quickest recipes I can. The only problem is that I’m also trying to find healthy recipes since there are so many temptations at this time of year. Thankfully I’ll get some help from this weeks Sunday Supper theme which is Easy Supper Recipes and I’m hosting! 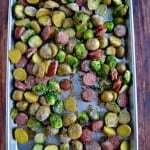 One category of recipes that seems to be quick, easy, and healthy are sheet pan dinners. Have you heard of these? Basically it comes the meat and the vegetables on a sheet pan and it bakes together in the oven. Sometimes herbs and spices are put on top of the food and other times a sauce is made. In general, these sheet pan dinners are ready in 30 minutes start to finish so they are perfect for busy people. This is such an easy dinner. Basically you just need pork chops, potatoes, and some type of vegetable. 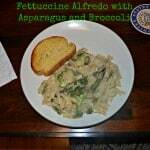 I used asparagus but you could use green beans, broccoli, or other vegetables. I put everything on a sheet pan, drizzled it with olive oil, salt, and pepper, and baked. Halfway through cooking I added the ranch seasoning (it’s just a packet mix!) and garlic cloves and finished baking. This meal is that easy! I found the flavor to be really tasty. I was worried it would be too salty but I thought that it was seasoned well and the ranch flavor was not overwhelming. I did think the asparagus got a little too done so next time I would add them in at the halfway point with the ranch and garlic. Otherwise, I loved this meal, the flavor, and the ease of making it! 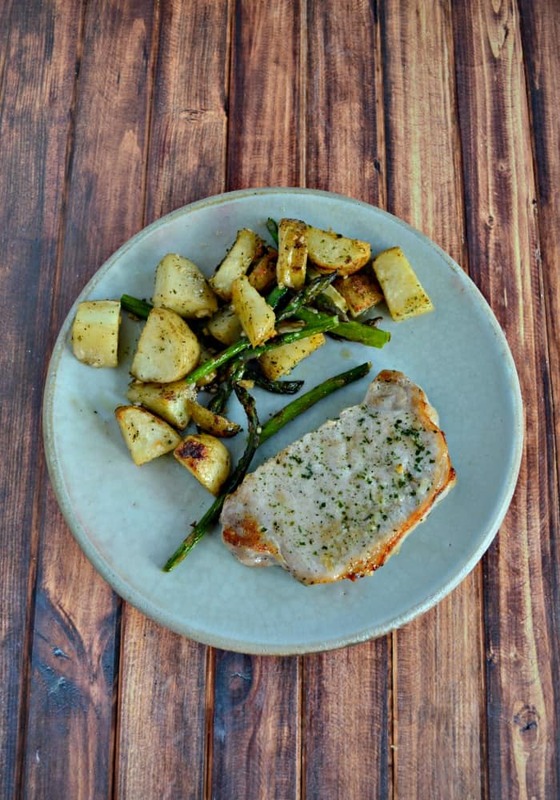 This one pan dinner combined pork, potatoes, and vegetables along with ranch seasoning for a tasty 30 minute meal! 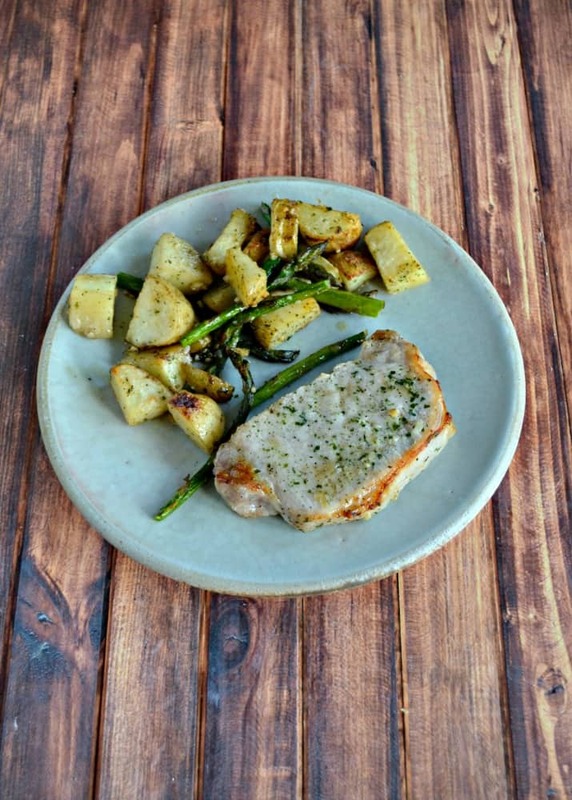 Place the pork chops and baby potatoes on a sheet pan. Drizzle with olive oil and sprinkle with salt and pepper. Remove the sheet pan from the oven and add the asparagus and garlic to the pan and sprinkle everything with the Ranch seasoning. 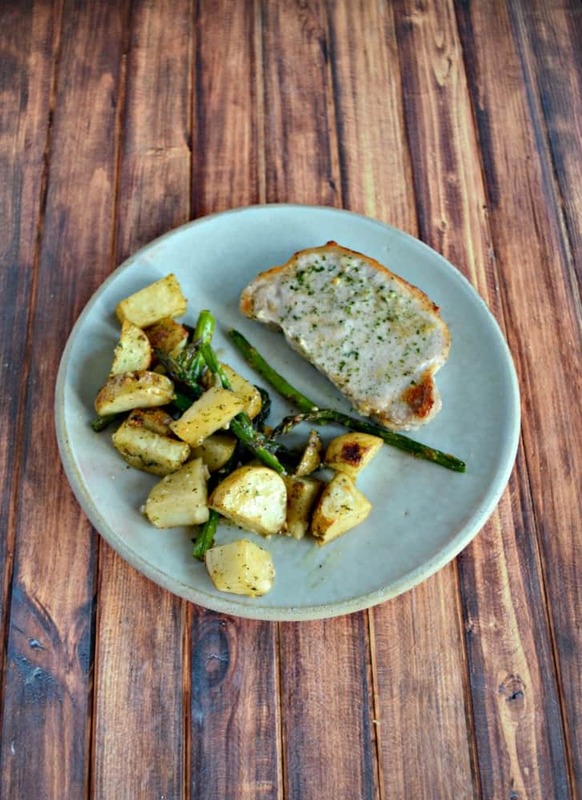 Return to the oven and cook for 10-12 minutes or until the pork chops are cooked through. Broil for 2-3 minutes to caramelize the pork chops. I love that you made this all on one sheet pan! I’m all for quick and easy clean up! Thanks for hosting, Heather. Have a great New Year! Pork and potatoes! Two of my faves for dinner and both are pretty quick to cook up. I’ll get putting this on the menu soon! Sheet pan dinners are so handy for busy days! Hope things get easier for you soon! Sounds like the perfect weeknight dinner. I have a packet of ranch mix in the pantry – definitely going to give this a shot this week! Love how easy it is, and how healthy! Perfect for January healthy eating! This looks great! 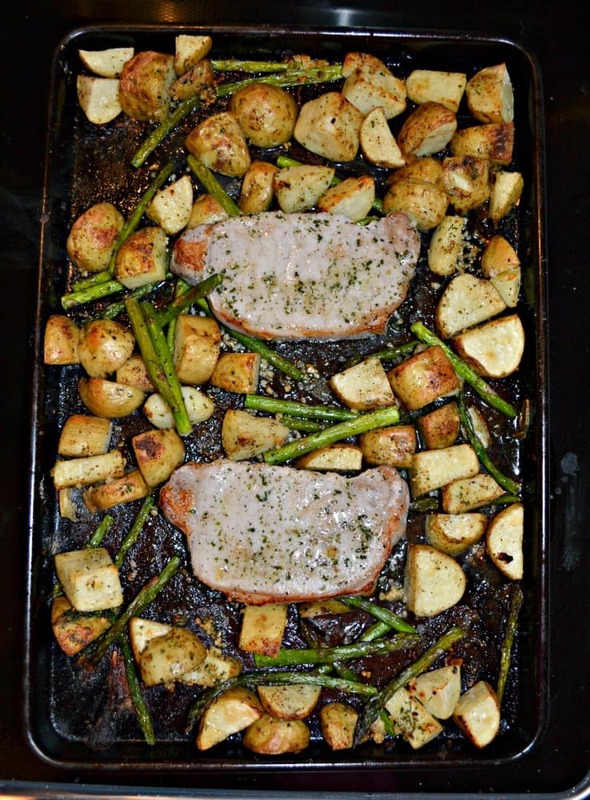 I am new to sheet pan dinners but they look so good and convenient. Love the idea of ranch because who doesn’t love ranch! 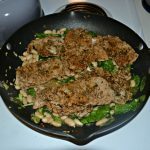 I love ranch, pork chops and one pan meals. A definite must try, thanks! Looks great Heather! Thank you for hosting. You KNOW this is my kind of meal – I love the addition of the ranch seasoning too! I love sheet pan dinners! The really help cut down on the kitchen cleanup. I hope you are enjoying your school break, I am. I am a fan of sheet pan dinners too, Heather, but I tend to default to chicken as the protein. Can’t wait to try your pork chops! They look so tasty! Thanks for hosting our kickoff to National Sunday Supper Month!